This fully air-conditioned, villa, is furnished to a high standard, with the kitchen & lounge leading onto the shaded terrace, overlooking the infinity pool, Mediterranean sea & mountains. This villa is equally suited for family holidays or a romantic getaway for two. There are two bedrooms downstairs which have a shower/wc room next door. The two bedrooms upstairs lead directly onto a huge balcony which is fully lit at night, where there is a large gas barbecue, dining table & seating for 8, where you can relax watching superb sunset views over the sea. All bedrooms have hairdryers. There is a bathroom upstairs with bath & shower above & WC. The master King size bedroom has an en-suite WC & shower room. Hand, bath & beach towels are provided. Air-conditioning may also be used for heating on winter evenings if required. Although this villa is advertised as no smoking, you are welcome to smoke outside, including the terrace and balcony. The villa has smoke alarms x 3. First aid box, Carbon Monoxide Alarm & fire extinguisher in the kitchen. Plenty of power sockets including USB charging points in Lounge and all bedrooms. We are now both retired professionals and live in Surrey. But for family commitments in the UK, we would be living in our villa in what we think is a beautiful part of the world. We think it is a slice of paradise. We hope you do too. Peace and Quiet. Yet a short drive away, you have great restaurants and bars. Some restaurants will send a complimentary taxi. 1 Bathroom with WC, bath and shower above. 1 Bathroom with WC and shower. 1 Bathroom en suite with WC and shower. All bathrooms have mirrors and shelves. Hand, bath and beach towels are provided. Flushing system will take toilet tissue, but nothing bulkier. Set to 24/27 degrees to prevent waking up too cold in night. The Air Con' will regulate itself. Via Air/Con units, very effective. Has a quick wash. Very effective. Secure parking within the walls of the villa for several cars. Hand, bath and beach towels. 2x4 seater sofas with small tables at each end. Coffee table. 42” flat screen local satellite TV, DVD & a large selection of classic films. Ipod docking station for your own music. There are a selection of indoor and outdoor games. Views to sea. Full a/c. 3 Gas rings. 1 electric. Dining table seating 8. Oven hob, fridge/freezer, dishwasher, toaster, kettle, water cooler & microwave. Full air con from adjoining lounge unit. The kitchen inventory of china, cookware & utensils is sufficient to cater from a dinner party to a barbecue. Dining at the kitchen table or more likely on the terrace or balcony and soak up the views. 42" Flat screen, wall mounted. Nilesat satellite which gives you good news coverage and some good films. British TV can be streamed via HDMI cable attached to TV. DVD player and 190+ DVD's. Large garden with Mediterranean plants with beautiful colours of the Oleanders. Huge 65 sq mtr balcony with large table and seating for 8/10. Large gas Bar-B-Q and 3mtr parasol to keep the sun off. Eat and drink or just laze and watch the sun go down over the Med. Fully lit. These can be hired from some of the larger Hotels. Shaded area with stone table for dining / drinking or lazing about watching the sun go down. Seats 6. There is skiing in the Troodos Mountains, which are about 2 hours from the villa. A short 5 minute drive down the road is the Korineum Golf and Country Club, boasting a superb 18 hole championship golf course, overlooking the sea and mountains. There is an excellent driving range with practice bunkers and short game practice area. There are also 3 excellent practice holes which you can play prior to your round or at a very reasonable rate on their own. You may rent golf shoes and golf clubs. The luxurious club house has bars, restaurants and an excellent, reasonably priced spa offering a wide range of treatments. Green fees are nearly always available. If not playing golf, you will be made very welcome by the staff to have a coffee, snack or meal, sitting on the balcony with some magnificent views. Other golf courses are situated further afield. Every entrance have 2 or 3 steps. Infinity pool with mood lighting. Various pool equipment and blow up toys and Lilo's. 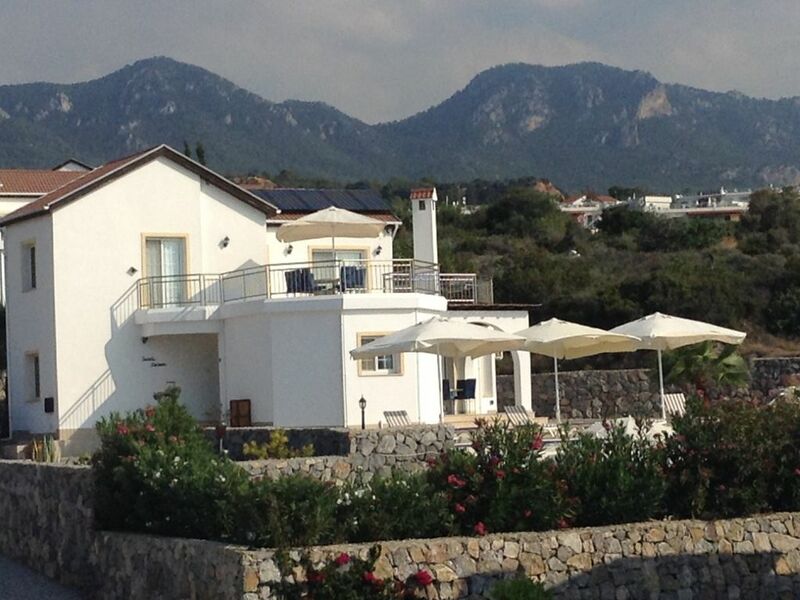 Notes on accommodation: This luxury villa is in an exceptional location with fantastic views. Situated in a private cul-de-sac and free from traffic, the villa is tastefully furnished and will cater for your every need. A hire car is essential for shopping and exploring the area. Although the surrounding villas (only 18) are well separated (30 to 40 mtrs), we ask that you are mindful of our neighbours privacy with regard to noise late at night. Cots and high chairs may be hired. All water inside the villa goes through a water softener and filters. Outside: Huge 65 sq mtr balcony overlooking the sea, pool and mountains. The views of the sun setting over the sea are magnificent. On the balcony is a large stone table, 8 chairs and a large gas barbecue, together with a large 3mtr sq parasol. We think it is the best room in the villa. The downstairs terrace is in shade and has a stone table and room for 6/8 chairs. 8 x 4mtr private infinity swimming pool with mood lighting roman steps and safety rail. There is a 3 metre tiled area around the pool. The pool is cleaned and PH level tested twice per week. Lilos are supplied, for pool use only. On a lower level next to the pool is a secluded patio with 2 stone tables and 6 chairs and a lovely border of Oleanders around the wall. There are 8 sun loungers with cushions and 3 parasols which adorn the pool. Secure parking area for several cars with walled garden with gate. Utility Room: Washing machine, iron and ironing board/step ladder, broom and mop. Picnic cooler box and ice blocks. Emergency light. Cleaning / Towels / Linen / The property & grounds will have been cleaned prior to your arrival. The property may be cleaned mid stay at your request. (£50) All bed linen is provided. Hand, bath & beach towels are provided. Immaculately presented villa in a lovely quiet location. Villa equipped with everything you could need during your stay. Great pool with beautiful views of the sea. Owners were very helpful, booking was easy and Phil kindly arranged our transfers, hire cars and a welcome hamper as we arrived late at night. Everything went smoothly and Mike their representative in cyprus was lovely too. We thoroughly enjoyed our stay, would highly recommend. Thank you Heather for such a glowing review. We are always delighted when our guests have the holiday they had hoped for. We continue to update and keep the villa in top condition. The villa Guzel Manzara is set in a quiet cul-de-sac, has views over the sea and mountains, it is equipped with everything you need for cooking and laundry, like home from home. The property is very clean and well maintained by Mike & Lyn who manage it, they are both very helpful as are the owners Phil & Maxine who offer a first rate service, eg Phil organised car hire and airport transfers at reasonable prices. We were a family of seven, 4 adults and 3 teenagers and all really enjoyed every minute of our stay. The pool lights at night changing colours are absolutely stunning. Plenty of bars and restaurants local to the villa and most restaurants will pick you up from villa and drop you back at villa if you book a meal. In the nearby Esentepe village there is a bank a post office and shopsfor groceries. Many thanks for your excellent review. We are always pleased when our guests enjoy their holiday in what we think is a beautiful part of the World. Thank you for taking care of our villa. We have just returned from a week’s holiday and I wish I was back there! We travelled as a group of 6, with ages ranging from 11 to 50 and this villa & location really did suit everyone. The villa itself is extremely spacious and well laid out. The owners have really thought of everything you could possibly need, from helpful information to pool games, DVDs & even books to read during the stay! They organized our transfer to the villa and back to the airport & also organized the car hire for us, it was a very easy & stress free holiday. Car hire really is essential as the points of interest are quite spaced out & the villa is situated in a nice quiet area ( perfect for having a drink under the stars on the terrace) However we did take a taxi a few nights so we could all have a drink and the price of taxi’s was very reasonable. North Cyprus isn’t a place I would have normally chosen for a holiday but we went out there for a wedding taking place in Bellapais Abbey, and I would definitely go back! There was so much to see and the location of the property was so beautiful that we now wish we’d have gone for 2 weeks. There was something for everyone, myself and my boyfriend could enjoy it as a couple & also as a family with the kids & my mother. We did make full use of the rental car and travelled across the island and we all commented that Guzel Manzara was in the best location, with the mountain & sea views but mainly to be able to watch the sun set over the sea of an evening. Just perfect! Take me back! The coast is only 300 metres away. There are many sandy beaches within a 5 to 10 minute drive. Many of these lovely beaches have a cafe & bars. If you travel further afield you may even find beaches to yourself. The coastline is famed for its breeding programme of Green & Loggerhead Turtles. You will find a turtle conservation area at Alagadi beach, where you can book a trip to observe the turtles laying their eggs & two months later you observe their offspring hatch & make their way to the sea. Ercan Airport (Lefcosa, Northern Cyprus), 35 / 40 minute drive. Requires change of plane in Turkey. Larnaca Airport (Southern Cyprus), 70 / 80 minute drive. Airport transfers and car hire can be arranged by us at discounted rates. A hire car is essential at this superb location. Ercan Airport 35 mins. Larnaca Airport 70 mins. Kyrenia (Girne) 20 mins. Esentepe Village 4 mins. Nearest Restaurant 4 mins. Nearest Bars 4 mins. Beach (Various) 5 mins. Golf Course 5 mins. Supermarkets 4 mins. Petrol station 1 min. N Cyprus is the Mediterranean’s best kept secret, with its historical sites and secluded sandy beaches. Loved for its slow pace of life & value for money, it combines a beautiful coastline and a sunny climate all year round. The currency of Northern Cyprus is the Turkish Lira, (change your money in Cyprus)), which gives you more value for money than the Euro. Kyrenia has its picturesque harbour & abundance of shops. In the harbour is the 9th century Byzantine castle, which houses the shipwreck museum, containing the remains of a 4th century BC ship and its cargo. Next door to Kyrenia is Bellapais, where Laurence Durrell lived and wrote the classic Bitter Lemons. In Bellapais there is a 14th century Abbey, giving spectacular views over land and sea. The Besparmak mountain range is home to some ancient castles including St Hilarion which is said to be Walt Disney's inspiration for the Magic Kingdom in Sleeping Beauty. The District of Kyrenia hosts many restaurants, bars, nightclubs and casinos. Esentepe is a quaint village just 2 kilometres up the hill from the villa. There are numerous bars, restaurants and mini markets. There is always something going on at one of the bars and in June the village hosts the Apricot Festival with various events going on all week. Other activities within easy reach are Diving, Sailing, Trekking, Cycling, Fishing, Horse Riding, Go Karting and if you fancy a flutter, numerous Casinos. If you drive east from the villa you will travel through numerous small villages, each with their own charm, until you come to the Karpas region, where you can observe wild donkeys or laze on a deserted beach. Driving west from the villa you will pass the Golf Club on your left, various beaches on your right and come to the Elexus Hotel and then the Acapulco resort. For a reasonable fee you can use their superb beaches with sun beds, parasols and cafe bars and have access to water slides, jet skiing, paragliding and other water sports. Booking Notes: The rental price is for the villa, up to 5 people, £35 per guest per week thereafter, up to 8, but it is also perfect for a small family. Rents for Christmas & New Year at request. A deposit of 25% of rental charge confirms your booking with the balance payable not less than 8 weeks prior to your holiday. Payment may be made by Cheque, Bank Transfer, Credit or Debit Card through Pay Pal. (subject to surcharge by Pay Pal), together with any foreign currency handling fee, if applicable. Changeover Day: Changeover days are flexible. If there is a change of residence on the same day, we would ask you to arrive after 6pm and depart by 10 am local time. If you arrive or depart outside of these times a further charge may be applicable. Notes on prices: Prices are in GBP. The prices are for the villa per week with up to 5 people staying. For more than 5 people there is an additional charge of £35 per person per week. Discounts on stays longer than 15 days. A £200 security deposit is required, which is refundable subject to inspection for loss and damage.